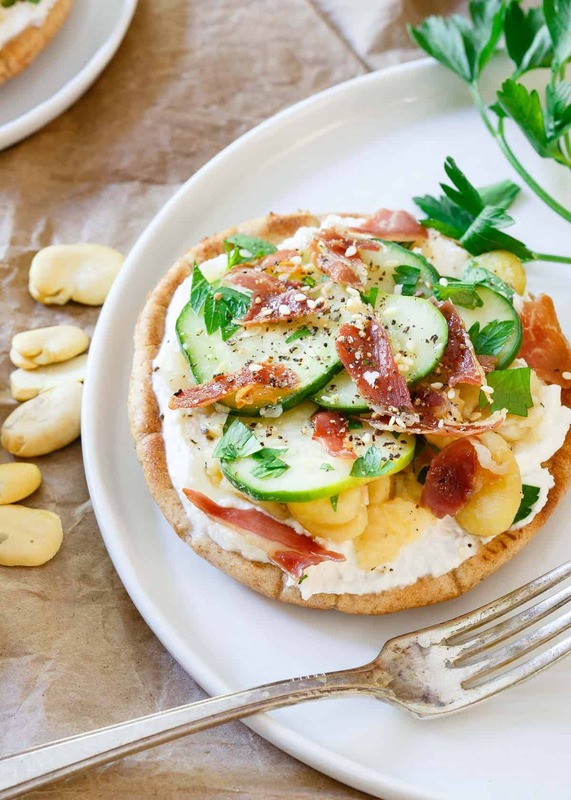 These fava bean grilled pita bites are layered with a base of creamy ricotta, tangy pickled cucumbers and crisp salty prosciutto. They make a sensational bite for a light lunch or appetizer! I can’t un-see oyster crackers from these pictures, although I assure you they’re dried fava beans. Ulysses pointed it out when I was breaking down the picture set up and now it’s all I see. Part of me feels like there should be clam chowder, not fava bean grilled pita bites next to them. Speaking of clam chowder and comforting soups, is there anything worse than having to make your own soup when you’re sick? On our *romantic* anniversary trip this past weekend (I talked about it in this butternut squash biscuit post), guess who ended up catching a head cold? Yeah. I got a head cold and he got a cold sore so we spent 3 days together with about as much physical contact as a member of PETA and a fur coat. Coming home yesterday afternoon with body aches and so much sinus pain it hurt to touch my face, all I could think of was some hot lime-y Tom Kha Gai soup. It’s all I crave when I’m sick but unfortunately, there are no Thai places anywhere nearby to get takeout from and so, I made my own. Sans oyster crackers though. It’s just not ok to have to make your own sick soup. Not.ok. 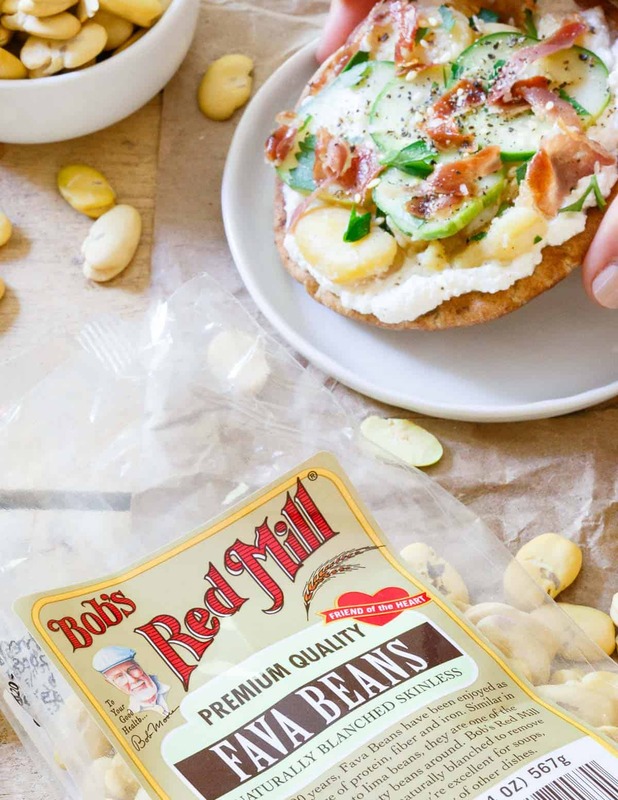 I seldom cook with dried beans but something about these amazing, hearty, huge fava beans from Bob’s Red Mill made me want to experiment with them. It’s not like you can find canned fava beans too easily on the grocery store shelf anyway. There’s so much goodness going on in these pita bites. 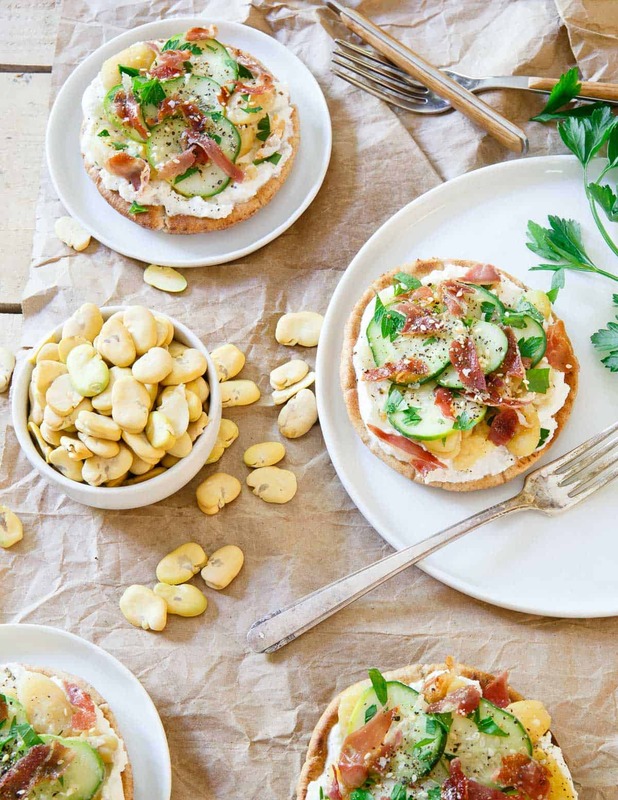 From creamy ricotta to hearty buttery smashed fava beans to tangy pickled cucumbers and the salty crisped prosciutto on top, they’re a tasty explosion of flavors with each bite. With the protein and fiber from the beans, these could easily be a light lunch but on small pita bread, I love it as an appetizer too. More will be made ASAP with the remaining beans I have, that is, once I can actually taste food again. 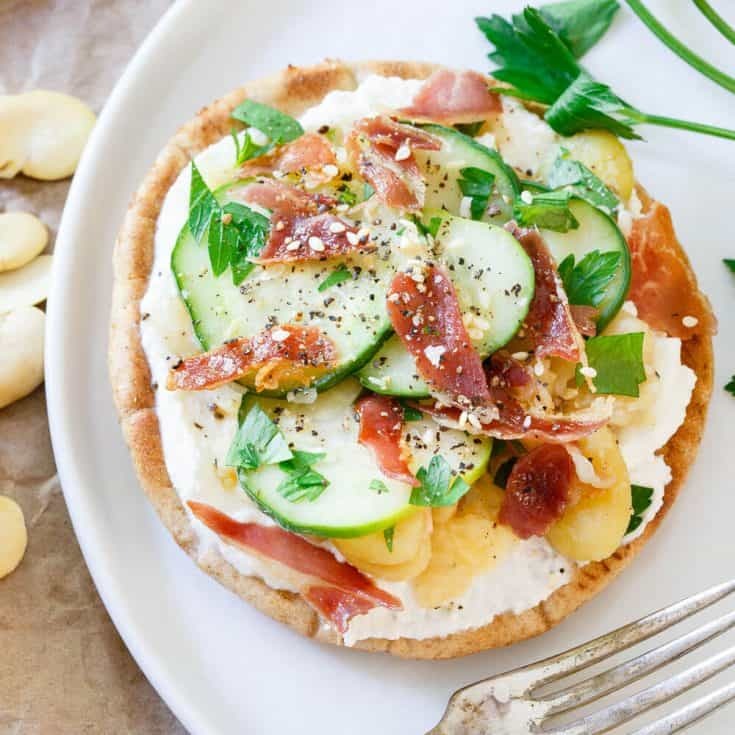 These fava bean grilled pita bites are layered with a base of creamy ricotta, tangy pickled cucumbers and crisp salty prosciutto. Rinse beans and comb through them to make sure there are no stones. Place beans in a sauce pot with 3 cups water, bring to a boil then cover and reduce to a simmer. Cook until softened but not mushy, about 30 minutes. While beans cook, place the cucumber slices in a shallow bowl with the vinegar and salt. Toss to coat all the slices in the vinegar and set aside. Drain beans once cooked and place in a bowl with the lemon juice. Gently smash with a fork a bit. The beans should still be very chunky, just slightly mashed. Place the prosciutto in a skillet over medium-high heat and cook until crispy. Drain on a paper towel and break into small pieces once cooled. Brush the pitas with the olive oil, grill or toast until just warmed. 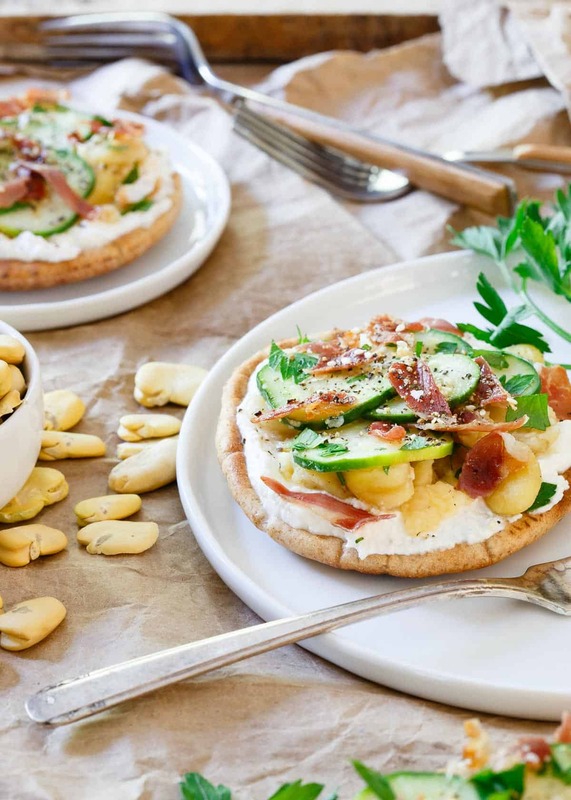 Assemble the pita bites by spreading the ricotta evenly on each pita, place the bean mixture next then top with the cucumber slices (draining from the excess vinegar before placing them on the pita) and crispy prosciutto. Garnish the pita bites with freshly chopped parsley, sesame seeds, sea salt and black pepper. These pita bites look and sound so flavorful! I’ve never experimented with dried beans, but I need to! I think we all assume they’re difficult and time consuming to work with but that’s really not the case! You know what? I’ve NEVER tried fava beans! How crazy right? I love basically anything grilled, anything with ricotta and pita bread ALWAYS..so I can’t wait to try these! Pinned! Summer colds are the worst! Hope you are feeling better. These pita bites are right up my alley! Excellent idea to have with beer after a long day ! Also, your photos are great ! Omg! These look totally delicious! Killer combo, Gina!! Get it, Hannible Ector – killer? I know, I slay me, too. Okay, I’ll stop with the terrible puns hahah But seriously, YUM!